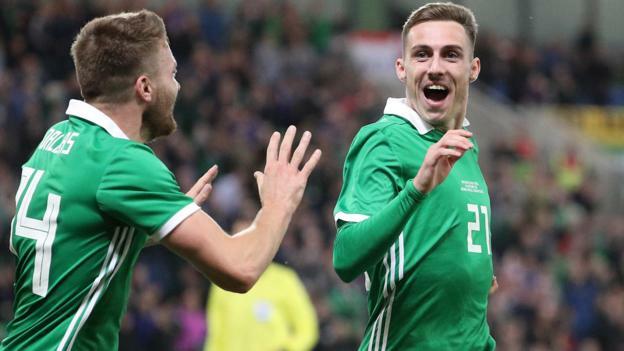 Gavin Whyte says his mother Patricia missed him scoring with his first touch on his Northern Ireland debut – because she was on holiday. Steven Davis and Stuart Dallas scored Northern Ireland’s other goals. “My mum will be over the moon. She is on holiday and I think she was travelling so I will have to send her the highlights,” said Whyte. Whyte’s goal – in the 67th minute – came after Israel goalkeeper Guy Haimou had saved Conor Washington’s initial effort. “”The goal means everything to me,” he said. “The ball came out to me and the only thing I could do was hit it quickly. “The last few months have been amazing. It’s all happened really quickly since I moved from Crusaders and I’m really enjoying my time at Oxford. Whyte, who won the Northern Ireland Football Writers’ Player of the Year and Young Player of the Year awards last season, has scored three goals in six appearances for Oxford. And Northern Ireland manager Michael O’Neill has noticed an improvement in the Belfast man since his move to Oxford. “I’m delighted for him getting his goal,” O’Neill said. “Gavin has looked stronger and quicker, and has made a real impact in training with the squad this week. “We’ve watched him for a few years now and I was hoping he would get the opportunity to move into full-time football.